It’s time to make some noise about hearing protection. According to the National Institute of Occupational Safety and Health, noise induced Hearing loss is the most common permanent and preventable occupational injury in the world. Hearing loss can occur from a single extremely loud sound such as an explosion, but more often than not it’s incurred gradually over time. Just as skin cancer usually grows as a result of regular exposure to the sun, noise induced hearing loss is most commonly the result of repeated and prolonged exposure to elevated noise levels. 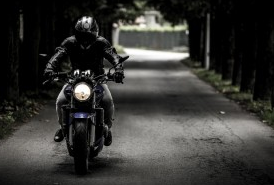 The unfortunate reality is that riding a motorcycle is a noisy endeavor, and the more you do it, the more likely you are to damage your hearing. The most widely recognized resource for recommendations on noise exposure limits is OSHA (Occupational Safety and Health Administration). OSHA offers a sliding scale showing that the louder the noise, the shorter the time your ears can safely be exposed to it. Noise intensity is measured in decibels and the decibel scale is logarithmic, so a noise that registers at 70 decibels (say, a vacuum cleaner) is 10 times louder than normal conversation, which typically rings in at 60 decibels. Sounds above 120 decibels (an ambulance siren) may be painful to hear and so would clearly pose a risk to your hearing health, but OSHA says permanent hearing loss can occur with sustained exposure (more than eight hours) above 85 decibels, or roughly the sound of a lawnmower—or the noise level inside your helmet while riding down the road at 65 mph. 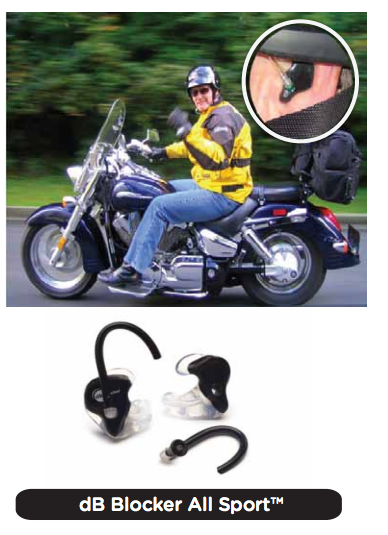 There is a lot of discussion about wearing ear plugs while riding a motorcycles; several opinions surface around whether or not doing it is a good idea. Amongst riders, like so many other elements of this sport, the use of ear plugs while riding tends to be a controversial topic; many riders swear by using ear plugs, but many others refuse to do it, wanting to be as connected their bike and traffic conditions as possible to enhance their safety. The truth is, however, that most riders on both sides of the debate are under-informed about what the real threats to your hearing are while riding, and how hearing protection actually works. We found some myths that have been documented for riders to think about when making their decision whether or not to use hearing protection. It is important that riders understand that the so called ambient wind noise is the silent killer and what you can do about it before it hurts your hearing. Myth #1: You can’t hear traffic hazards, sirens, your bike, or other important sounds while wearing hearing protection. Wearing ear plugs does block sound, but the way it actually affects your hearing is counter-intuitive. The real killer of hearing, and what we are trying to prevent while riding, is wind noise; the continuous, high-frequency sound created as you rush through the air at riding speeds. What we want to hear are low-frequency sounds, things like cars around us, engine RPM, and approaching sirens. Because wind noise beats on your ears non-stop while you ride, it creates a condition called temporary threshold shift (also referred to as TTS), which is a temporary hearing loss that results from continuous over-exposure to sound (we’ve all experienced this at a concert, races, when operating machinery, etc.) In other words, you go partially deaf for a while after an extended period of riding. That temporary deafness is even more dangerous to your safety on the road than wearing ear plugs, because it affects all frequencies of hearing. Proper hearing protection prevents that from happening, and cuts high-frequency wind noise while still allowing important low-frequency sounds to be heard. Ask about our dB Blockers made especially made for riding. Myth #2: You only need to wear hearing protection if you have a loud bike. Naturally, loud bikes are more likely to create hearing damage than quiet bikes, when revving or accelerating for example. But once again, the biggest danger to your hearing while riding is wind noise, and it piles up a lot faster than you think. Whether you ride a thunderous V-twin or a stock 250, the sound of your bike is minuscule when compared to the volume of wind noise, which is usually around the 100-110dB range at highway speeds. It is a constant, high-frequency sound; the type that is the biggest threat to your hearing, as you tend to not notice it slowly beating your eardrums to death. Myth #3: You don’t need to wear hearing protection if you wear a full-face helmet. True, wearing a full-face helmet does cut exposure to sound, but to degree that is not significant with respect to hearing damage. Check out these numbers: different studies show a reduction in the range of 5-10dB when wearing a full-face helmet; but at 100dB-plus levels found at normal highway speeds, this is still well within the territory of permanent hearing damage. Some helmets flow air so well, the wind noise can actually be almost equal to that of not using a helmet at all! Protect Ear USA provides personalized industrial earplugs that matters to both, the individual as well as the organization, because of the benefits that proper hearing protection can offer. dB Blockers custom molded earplugs are commonly used in the following industries and environments, learn more about two way hearing protection. Myth #4: A windshield/fairings will cut wind noise enough. Much like the difference between full-face and half-helmets, there is a reduction in sound level, but not to a significant degree. Depending on the style of windshield or fairings, and the height of the rider and his body position, the resulting turbulence may mean there is hardly any reduction in noise at all. Re ducing ambient noise is a concern for some riders. If you plug your ears, how will you hear your bike’s engine or, more importantly, monitor traffic around you? Learn more about hearing protection you can actually hear through… dB Blockers. Wind noise while motorcycle riding regularly exceeds the levels at which hearing damage will occur. Protect your hearing without blocking the sounds you want to hear with Custom hearing protection, All Sport dB Blockers.